For over 35 years, Barry Oshry has uncovered core truths about how we operate in large organizations through The PowerLab, an educational program that has been called "The World Series of Leadership Development Activities." 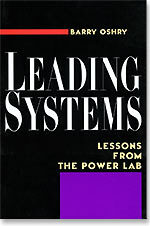 In LEADING SYSTEMS, Oshry reveals the lessons he has derived from his PowerLab experiences, lessons that have been central to his innovative insights about human systems and system leadership. Challenging conventional thinking, Oshry reveals the limitations of consensus, the validity of unilateral action, and the restrictions that our values can place on power. He reveals how the problems we often believe to be personal are in fact systemic, and he demonstrates what it takes to break out and elevate ourselves and our systems to higher levels of possibility. "LEADING SYSTEMS is the best book on systems living and action I HAVE EVER READ." "Oshry's work is amazing, like one of his Power Labs: energizing, riveting, intense, in-your-face, fascinating, exhausting, brilliant and innovative." "LEADING SYSTEMS gets to the dynamics of leadership and power relations more effectively than the usual jargon and rhetoric. People who read this book will see that they can avoid the pitfalls of system life and create healthy societies." LEADING SYSTEMS is a trip worth taking. Barry Oshry is a leader in getting to the core truths about how we operate in large organizations. His work is equally profound in explaining how we operate within society as a whole. He offers a clarity that rarely exists in any other setting."